It’s tough feeling like you’re stuck between a rock and a hard place, but, if you’re stuck between The Rock and a hard place, then the solution is easy: Always go with The Rock. Dwayne Johnson stars in San Andreas, the new disaster film from the director of Cats & Dogs: The Revenge Of Kitty Galore. In the movie, Johnson plays Ray, a helicopter pilot who basically takes it upon himself to save the population of California (including Carla Gugino, Alexandra Daddario, and Paul Giamatti) when a high-magnitude earthquake wreaks some major havoc on the West Coast. 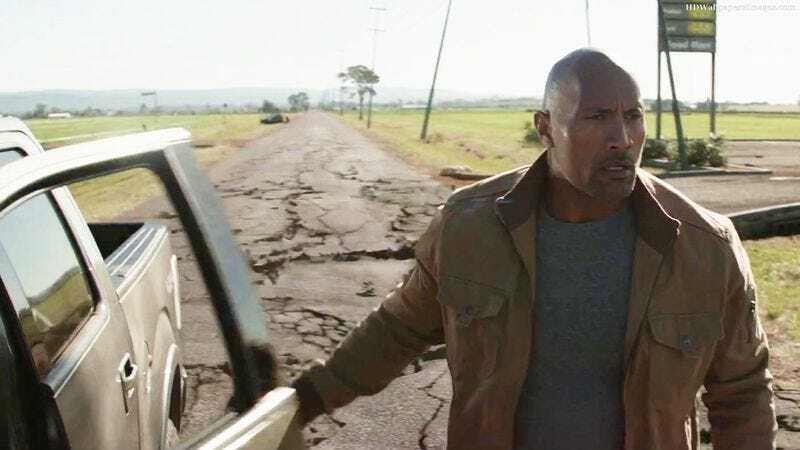 San Andreas opens nationwide on May 29, but The A.V. Club and New Line Cinema have an opportunity for you to win a pair of passes to see it for free on May 26. For your chance to snag two tickets to the advance screening, simply follow the link here and enter your information. As always, seats for screenings are first come, first served, so be sure to arrive early. An official plot synopsis and trailer for the film can be found below.